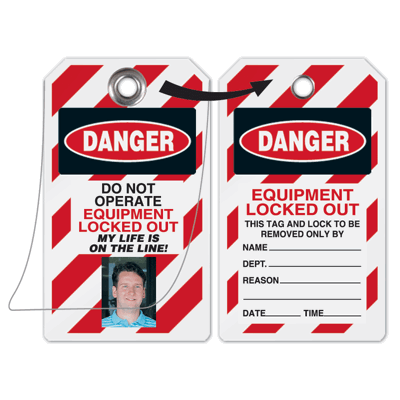 Seton’s photo lockout tags are made of vinyl, which resists abrasions, chemicals and grease. The tags are self-laminating with attached transparent, self-adhesive overlay, keeping the employee’s photo and important tagout information clear. The tags accommodate photos up to 1-¼" high. What legend do you need? 29 CFR1910.147 states that lockout tags must include the appropriate legend to warn against hazardous conditions if an equipment is energized, specify that the machinery cannot be operated until the tag is removed, and name the employee applying the lockout device(s). Choose from our the most frequently selected legends which are Do Not Operate, Equipment Locked Out, and Do Not Operate/Equipment Lock Out. To be better guided about tag compliance, please click here. You may also browse our other types of lockout tags here while keeping in mind the specific application per type. Front of tag reads: Side 1: "Do Not Operate"
Back of tag reads: "Equipment Locked Out"